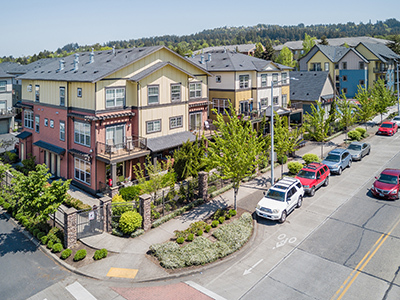 HFO Investment Real Estate (HFO) announced the sale of Latitude Apartments located near Clackamas Town Center mall in Happy Valley for $58 million. The Latitude Apartments is a gated apartment community consisting of 210 apartments with an average unit size of 1,133 square feet. Built in two phases between 2008 and 2014, the sale represents the second largest apartment transaction for Clackamas County this calendar year. Latitude Apartments consists of 33 three-story apartment buildings and one clubhouse on 6.89 acres across from Clackamas Town Center − one of the largest regional malls. The transit-oriented development is convenient to I-205 and easy walking distance to MAX light rail and several bus lines. Latitude Apartments offers its residents numerous community amenities including a dog run and grooming station, electronic parcel lockers, bike repair station, fitness facility, pool, basketball court, and direct-entry garages. The seller was Bay Area investment firm The Reliant Group and the buyer was global real estate investment company Kennedy Wilson. The sale represents a price per unit of $276,190 per unit or $243.76 per square foot.